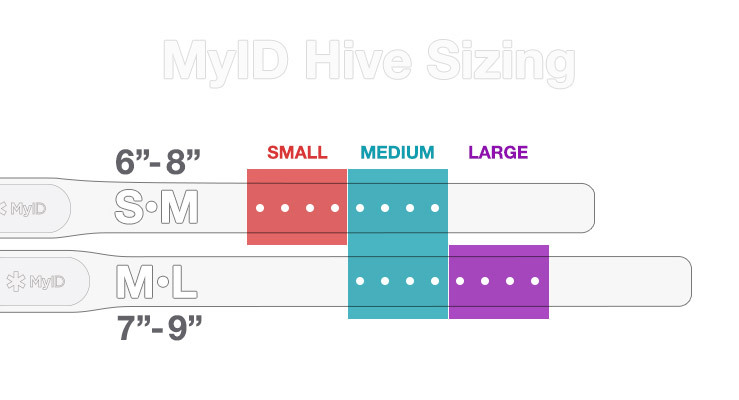 The MyID Hive band was designed with the active lifestyle in mind. 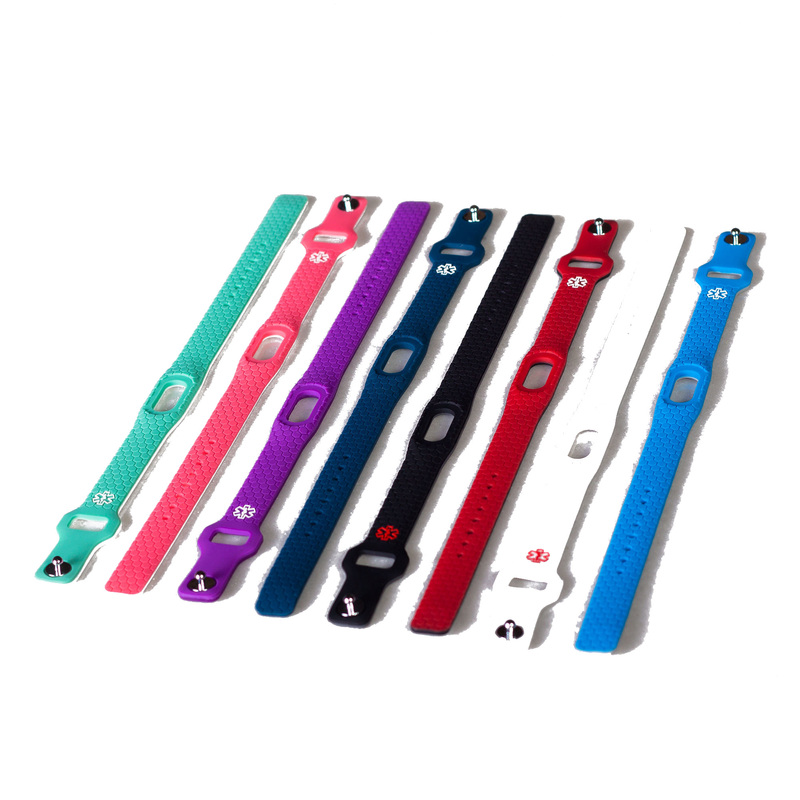 The band is made from a comfortable fluoroelastomer material with a simple snap-and-tuck fastener. 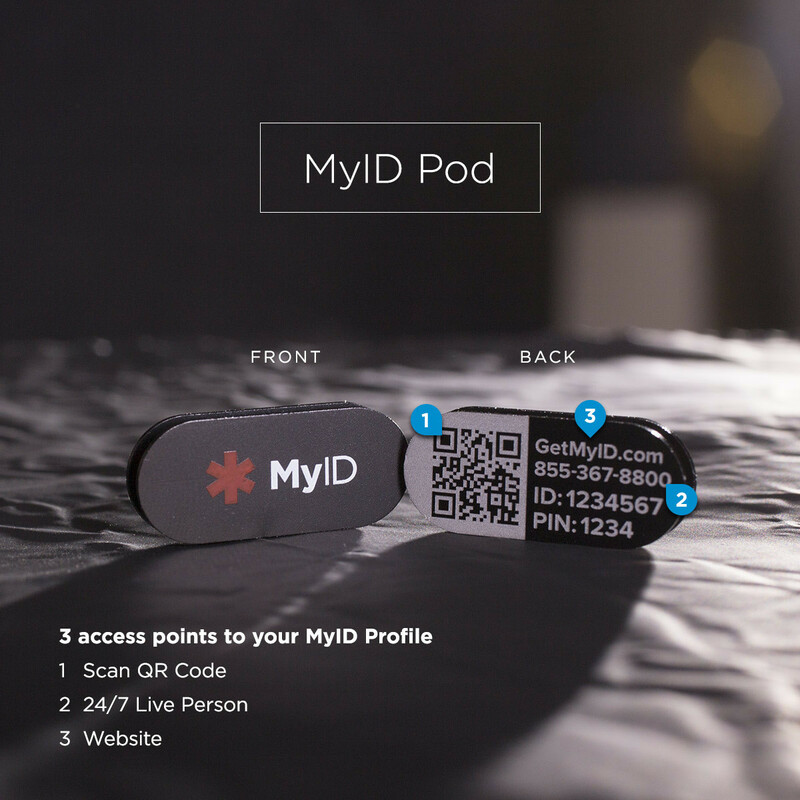 The metal MyID Pod is made from a solid piece of anodized aluminum that is modular in design - which allows it to fit into a variety of bands, necklaces, and wearables. The 3 access points to your medical profile are laser engraved for maximum durability. 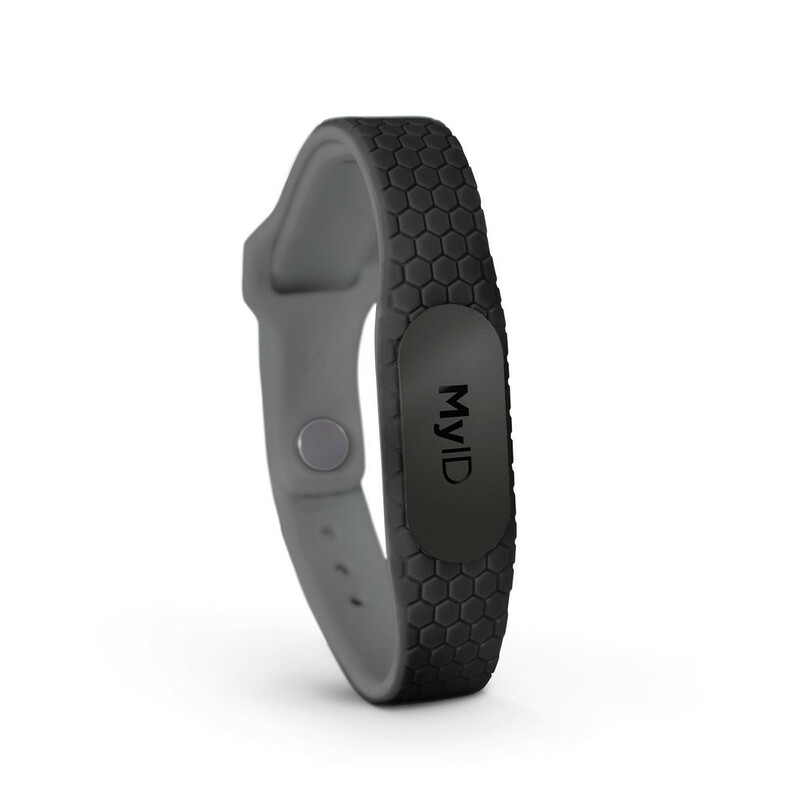 MyID is the perfect bracelet for people with medical needs, people with active lifestyles, aging parents and young children. It provides the fastest and most complete medical profile to first responders. When you receive your bracelet, it will arrive with instructions on how to access the MyID web site where you will enter your information. First responders are trained to look for ID bracelets that give them the critical information they need to save your life. Your MyID stores your emergency contacts, medical, allergy, and insurance information in a secure, online profile that is immediately accessed via smartphone or 24/7 emergency hotline. First responders can scan your MyID profile QR code with their smartphone or call our 24/7 live operator to access your Emergency Profile. Since your profile is securely stored online, you can update your information anytime. Your online health profile is flexible, so you only share information you want to share. You can lock your account at any time if	you lose your MyID. Your information is stored on a secure, encrypted server. Security is very important to us. That's why we use Secure Hash Algorithms (SHA) to make sure your data is safe and sound. Quickly manage your profile right from your iPhone or Android phone with the Free iOS and Android Apps. Plus, display your custom QR code directly on the lock screen so first responders can quickly access your profile. 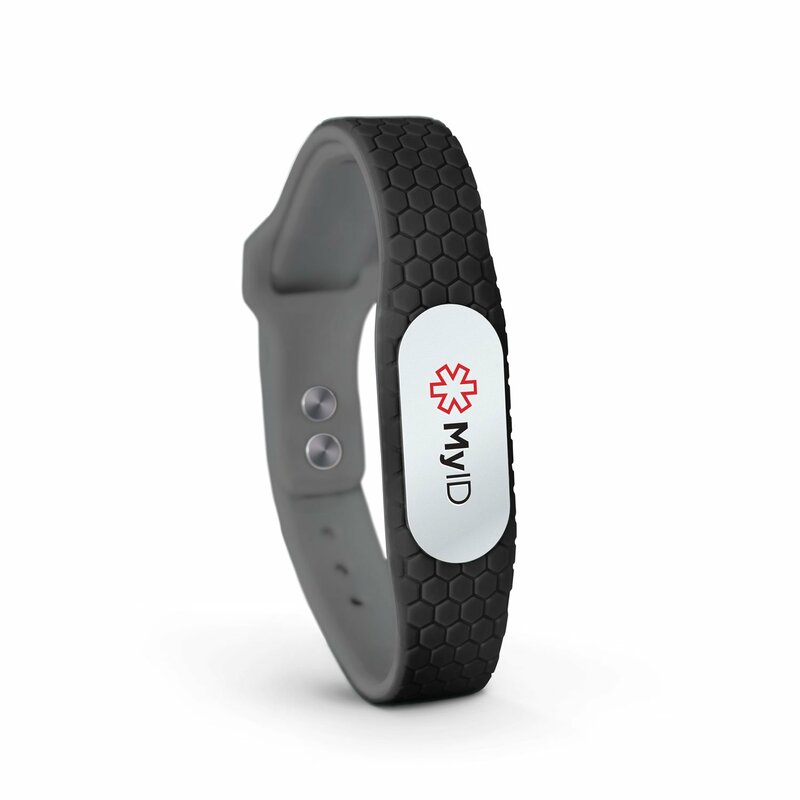 The MyID has many features that a traditional medical bracelet does not. 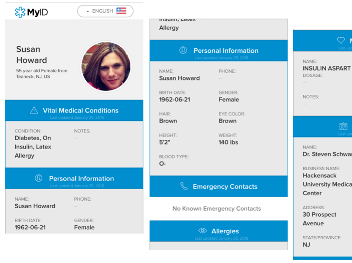 Instead of being a one-time, fixed information piece, MyID is dynamic and can have the medical information continually updated. 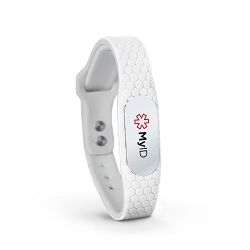 If you move, change phone numbers or develop new medical conditions, there is no need to purchase a new bracelet. Simply login to your profile and update your information and it will be instantly available to first responders. 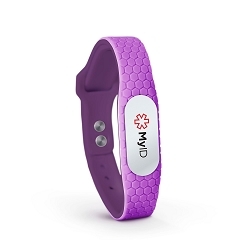 Very pleased with the MyID bracelet for my mother... highly recommended!! I'd order this item again in the future! I ordered three of these. One for myself, and one each for mother in law and sister in law. They are very nice. It was quite easy to enter information on the website also. I'd order this item again in the future!